9/9/08– Appointment – New York, Metropolitan Museum – It was the most awaited nomination in the museum world. Thomas Campbell has just been named director of the Metropolitan Museum succeeding Philippe de Montebello who will retire at the end of the year (see news item of 10/1/08). According to Lee Rosenbaum’s very well informed blog, he was one of the four last possible pretenders, with two other Met curators, Gary Tinterow a long time favorite and Ian Wardropper. The director of the Schirn Kunsthalle Frankfurt Max Hollein was, said Lee Rosenbaum, also part of the list. Thomas Campbell, 46, was born in Cambridge, England. He studied in Oxford and at the Courtauld. 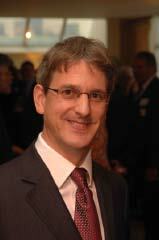 He has worked at the Metropolitan Museum since 1995 (he entered as Assistant curator). He recently organized a much acclaimed exhibition : Tapestry in the Baroque : Threads of Splendor and was also responsible for the one dedicated to Renaissance tapestries, in 2002. His most recent publication is Henry VIII and the Art of Majesty : Tapestries at the Tudor Court. He has also been Supervising Curator of The Antonio Ratti Textile Center, which houses the Museum’s collection of textiles. He will assume directorship on January 1, 2009.